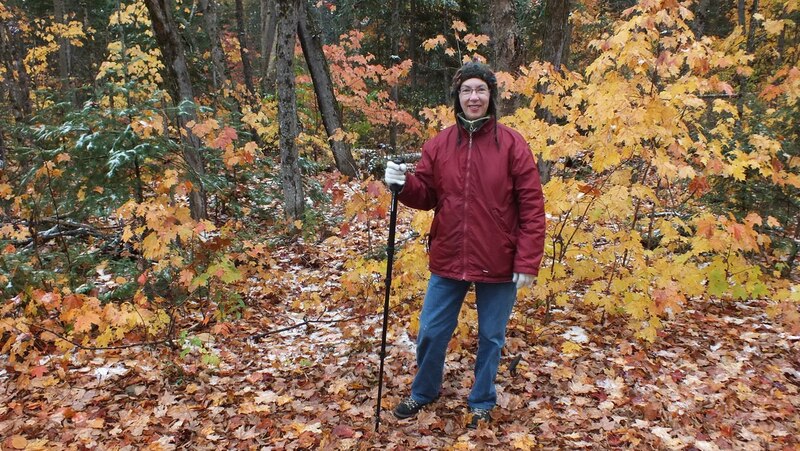 With fall drawing to a quick close, Bob and I took advantage of the weather for one last autumn hike in Algonquin Provincial Park, in Ontario. 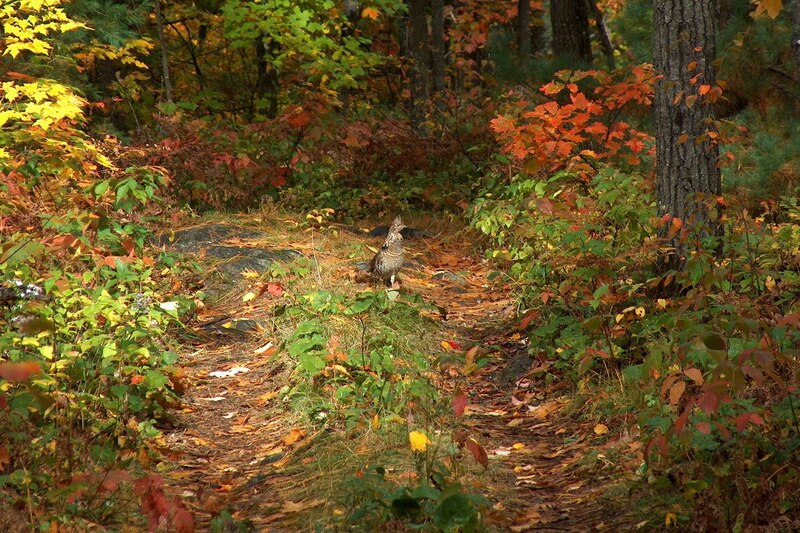 We are always on the search for wildlife so were pleased to come upon a Ruffed Grouse. 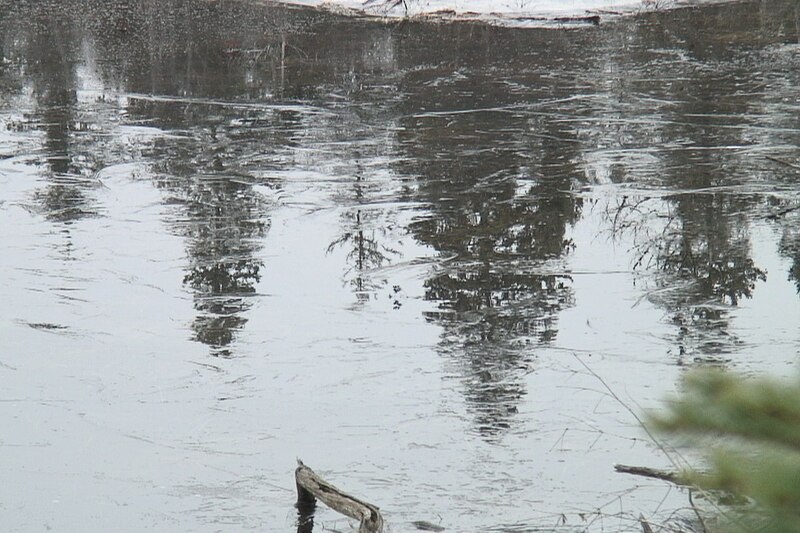 so we were not surprised to find a thin layer of ice on most ponds. I was all set for the cold weather, sporting gloves and a warm woolen toque that Bob had brought back for me from Berlin , Germany, on one of his photo shoots. 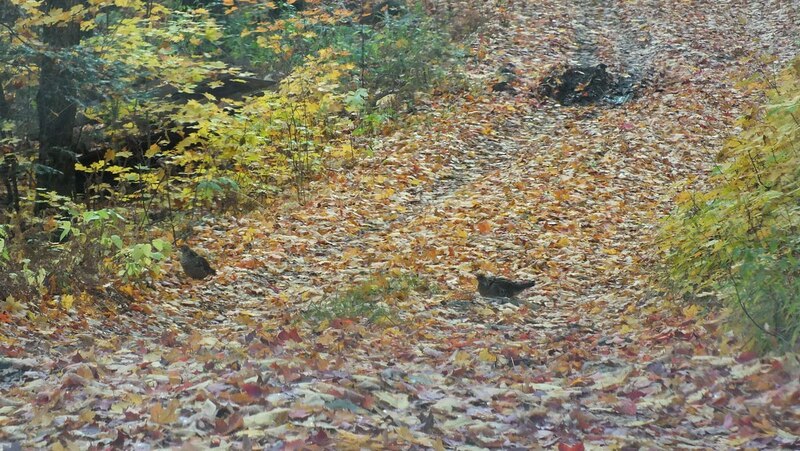 A Ruffed Grouse was strutting along the same trail amidst the coloured leaves, which thankfully deadened our own footsteps so as not to alert the bird. 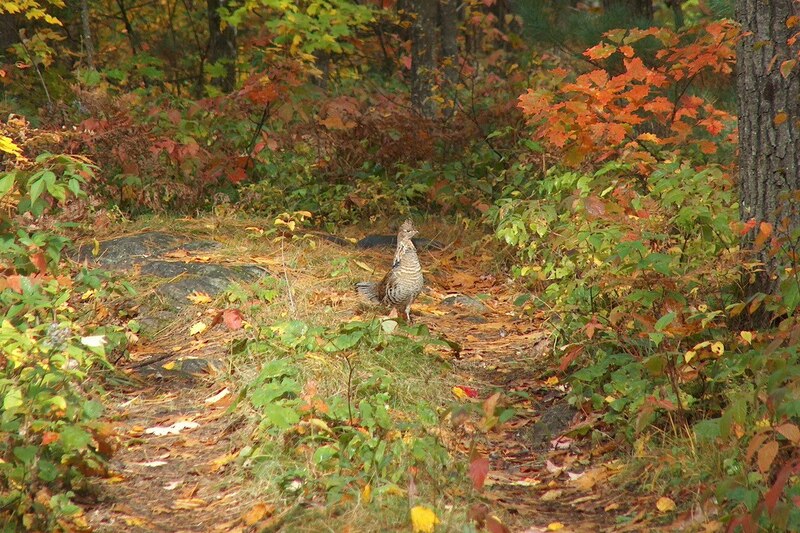 We have had many occasions over the years to see Ruffed Grouse when hiking in and around Algonquin Park, in northern Ontario. 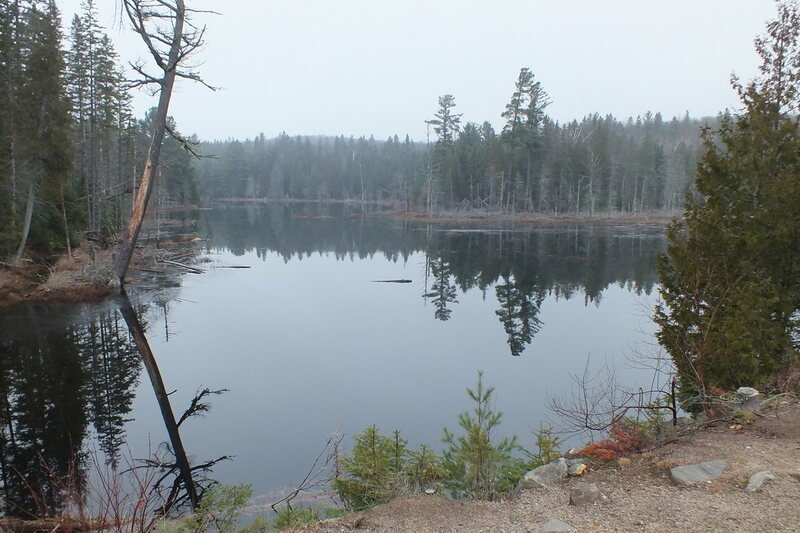 One of the best places to find them is along a hiking trail or a dirt road. 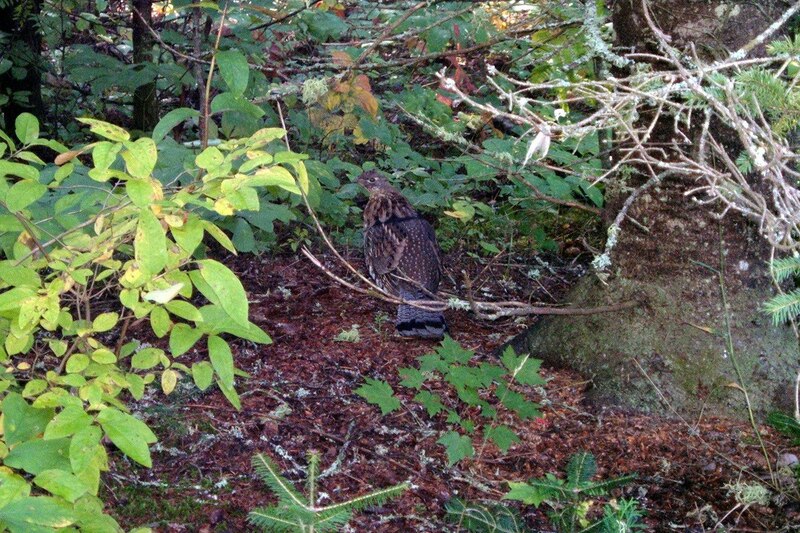 A little further on, two Ruffed Grouse emerged from the bushes and crossed in front of us. This pair seemed to be foraging for food, perhaps hazelnuts or acorns. Ruffed Grouse need grit for their gizzards to help grind up hard food items such as this, so that is why they are often seen along a dirt road where small particles of sand are readily available. 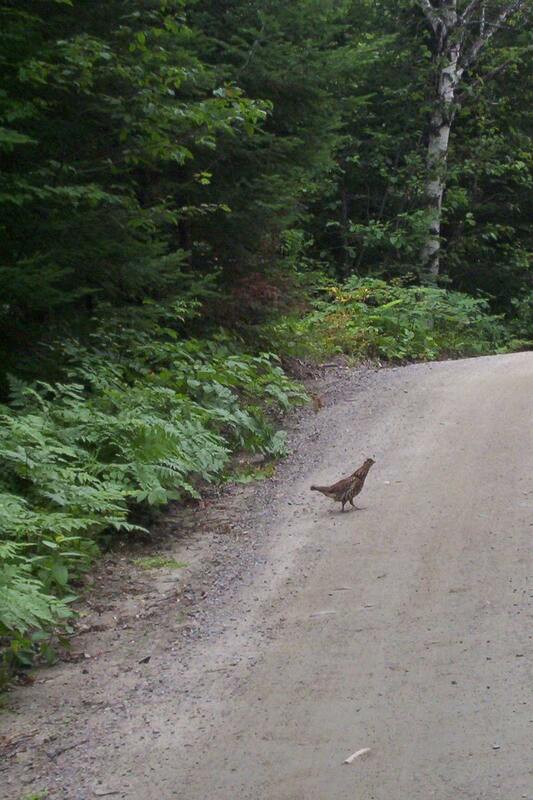 I didn’t want to startle the Ruffed Grouse, so had to remain very still. They are very elusive woodland birds, but this one crept ever closer to my lens. 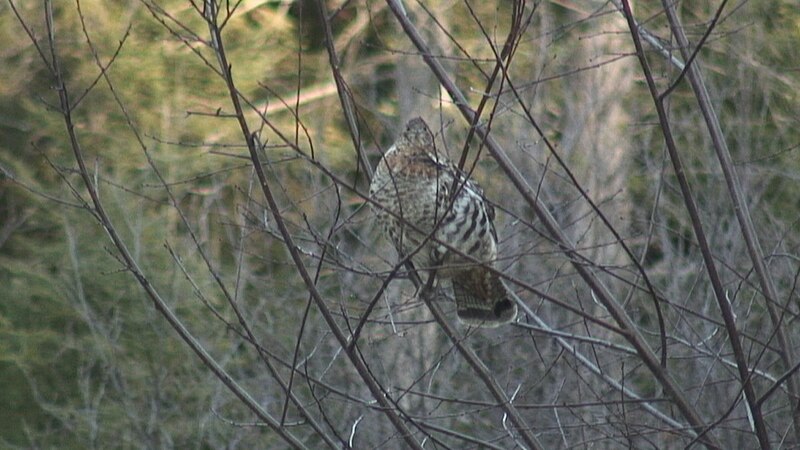 Further in Algonquin Park, near Lake of Two Rivers, we happened upon this Ruffed Grouse eating buds while attempting to sit in a low bush. The grouse was intent on the task as it eagerly nipped off bits of vegetation. 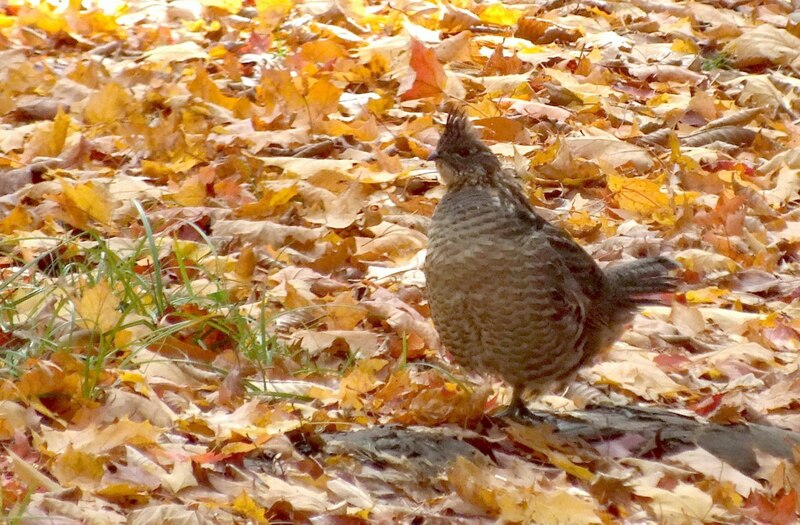 Ruffed Grouse are omnivores and therefore eat buds, leaves and berries, but they will also eat insects. 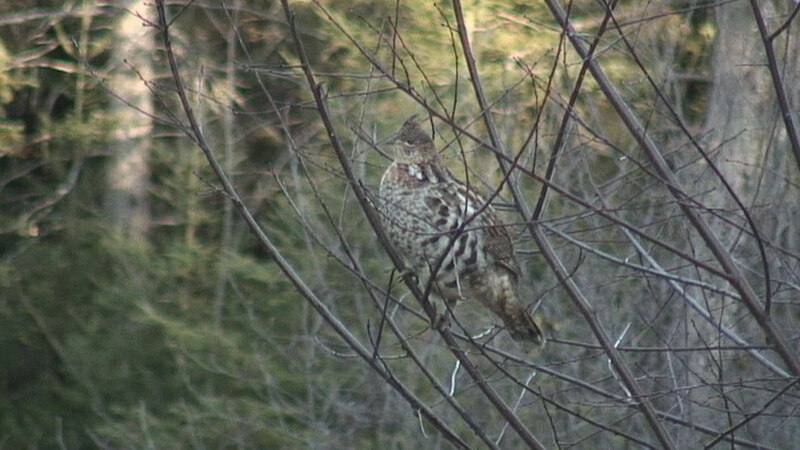 In this video, you get a really good opportunity to observe the meticulous work of the Ruffed Grouse as it plucks off the best buds on the tree. The Ruffed Grouse had a firm hold on the slim twigs of the bush, but threatened to lose its balance as it moved along their length because the small branches could barely support its weight. 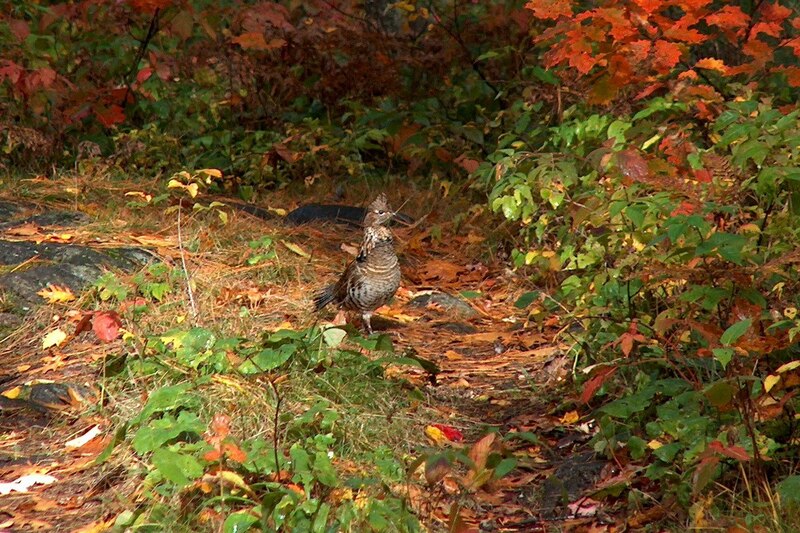 Ruffed Grouse, which do not migrate, are a common year-round sight in Algonquin Park and the surrounding forests. One summer, when driving into the dock at Black Lake in Haliburton County, we had occasion to see another one of these woodland birds. The thrumming of a Grouse could be heard in the undergrowth as we progressed through the bush. After finally pinpointing its location, there was only time for a couple of pictures before it vanished into a thicket. 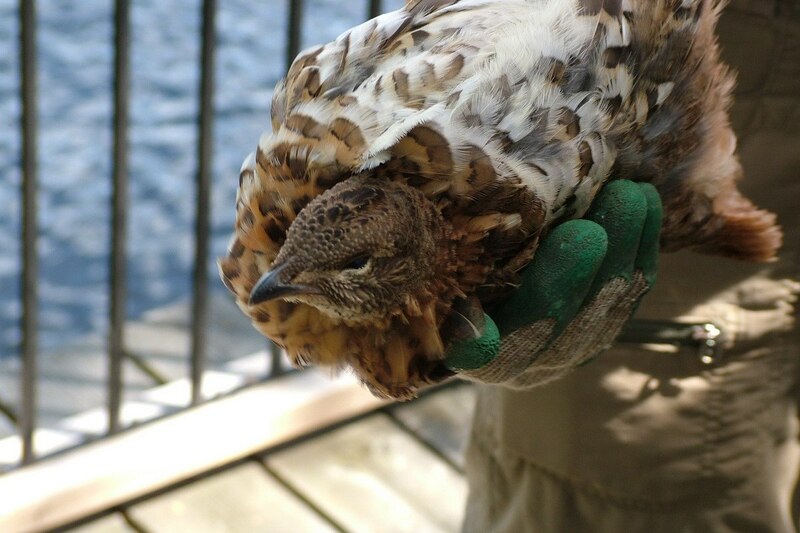 On another visit to the cottage, we spent an afternoon hiking, and upon returning to the cottage, we were saddened to find that a Ruffed Grouse had been killed when it flew into a glass window and broke its neck. What a loss of such a beautiful bird. It is always a nice surprise to come upon any wild birds when hiking in the forest. Although some really stand out against the foliage, such as the Pine Grosbeaks, others like the Ruffed Grouse blend in so well with their surroundings that spotting them is not always easy. They are well suited for camouflage against their predators. Beautiful colors on the Grouse and the Grossbeak shots. Your “newt”, however, is actually a skink. Newts are amphibians, and skinks (larger, with dry scaly skin) are reptiles.